As golfers navigate their way through the exceptionally hot and humid summer days of 2016, there is only so much that can be done to manage the slick grips and sweat that make grip confidence come into question. 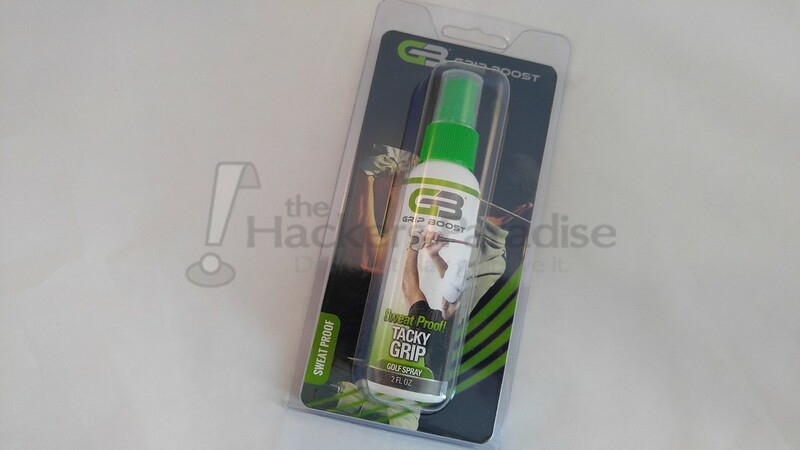 For Grip Boost, they have taken their impressive football and baseball gripping products and modified them to accommodate the golfer in a spray form. 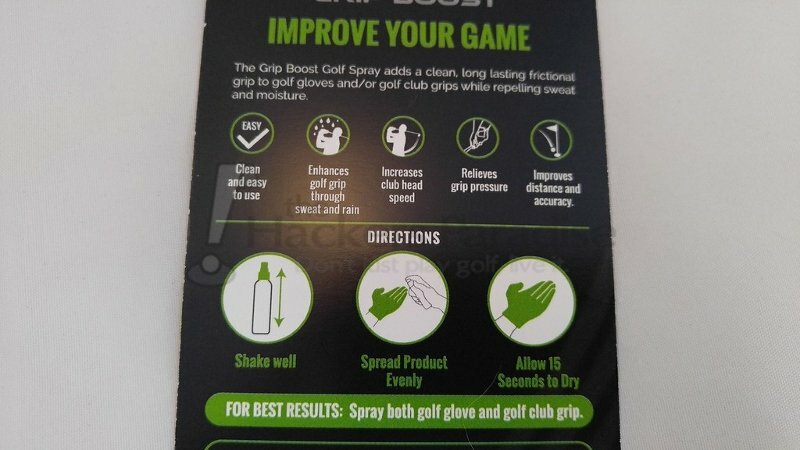 Our Grip Boost Golf Spray instantly adds a mess-free, long-lasting frictional grip to golf gloves and/or golf club grips while repelling sweat and moisture. A national study by leading golf grip brand found that golfers save an average of 3-4 strokes per round by re-gripping their clubs! Just a couple of sprays of Grip Boost Golf Spray is just like re-gripping your clubs—only it’s just faster, easier and more cost effective. The best part about the Grip Boost Golf Spray is that our grip technology works through sweat, rain and humid conditions. No need to worry about sweaty gloves ruining your grip again! Our product also aids golfers in easing grip pressure and tension, so their swing is smoother on the point of impact. The Grip Boost Golf Spray is designed to help golfers maintain a light grip on the club so they can generate maximum club head speed. Light grip is the key to keeping the muscles of the hands, wrists, and forearms loose and ready for action. The power behind your swing starts in the lower body. The rotation of the legs and hips turn your shoulders and unleash your arms, wrists and hands. All of that lower body technique, core strength, and efficiency can be undone when the chain is broken by a tense grip that inhibits the transfer of energy. A relaxed confident grip maximizes the fluidity of movement in your body for explosive swings. Always maintain a light grip for explosive swings with the Grip Boost Golf Spray! 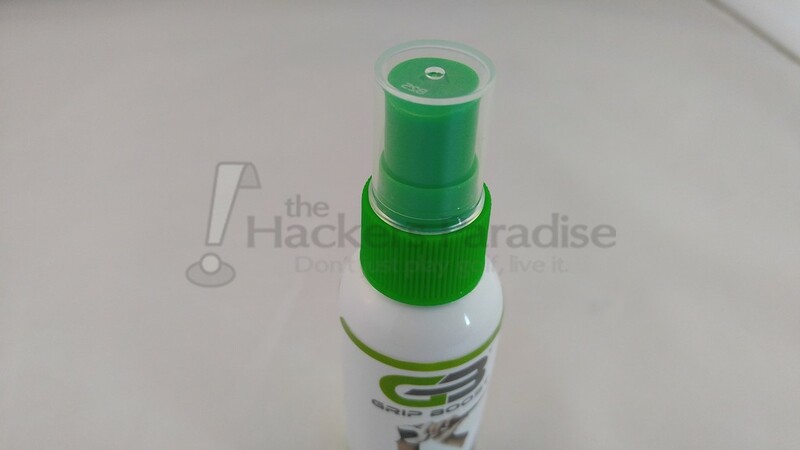 The Grip Boost spray application is slightly denser than a typical spray sunscreen or bug spray. The spray device is not continuous, but rather produces a limited amount of spray each depression. This will allow golfers to not only limit the spray to as much as they prefer, but also isolate it to sections of the grip they prefer to have tackier. After shaking vigorously, applying the product is very easy to either the grip or the glove, with a small amount of the gripping agent getting on the spraying finger which does not seem to linger for too long afterwards, especially when treated with a wet towel before it dries onto the hand. While golfers can enjoy maximum tackiness by spraying both the glove and the grip, those who have relatively tacky grips to begin with can spray their glove directly. After a small amount of time, the agent seems to be stable and maintains an obvious tack for a long period of time, upwards to and beyond the length of a round of golf. While a majority of the tacky feeling is experienced on the outer portion of the glove and certainly while gripping a club, there is some tacky feedback on the hands when the glove is worn, especially when applying to a glove with breathing holes throughout. After some time goes by, the most notable element of the sprayed grip is present when gripping clubs. It does not feel awkwardly tacky when removing to be pocketed or put back on during time around the greens. As previously mentioned, the agent supersedes most sweating, and reduces most slip concerns on extremely hot days which is certainly a confidence booster. There are two ways to apply the Grip Boost product to the grip, depending on the user preference. For some, covering the entirety of the grip will make a huge difference, with the tacky feeling overly present for some time. For others, spraying on the upper portion where the glove is present on the grip will reduce a lot of the tacky sensation in the non-gloved hand, while still presenting the ability to gain improved grip. This comes down to the preference of the individual, as the tacky sensation on the hands is not continued after gripping and swinging the club. When spraying the grip, it is easily visible where the product is being applied. One user noted having a different application process as the spray seems to isolate unless the grip is coated entirely, however after hitting that club numerous times, acknowledged that a few quick sprays is likely all they would need for confidence in their 15 year old grips (the perfect candidate!). After about twenty to thirty seconds, the product seems to have stabilized on the grip, and not unlike the glove, provides excellent tacky feedback to the hands for the remainder of the round. There are plenty of products out there that rebuild some of the tack on a grip and bring it back to life, but it does not seem to be comparable to a product that can be sprayed on for guaranteed grip each time a golfer grabs a club. With the Grip Boost product applied to a grip or a glove, there was a clear element of added confidence that the grip would not twist or slide even on the sweatiest, hottest days of the year. This included a variety of grips and gloves between brand new, and horribly worn down. While the newest grips provided the best tack paired with the Grip Boost, all scenarios where the product was applied proved beneficial. While the Grip Boost golf product is relatively new to the golf industry, their proven track record of grip agents across multiple sports, along with the experiences during this review provide a genuine confidence that any golfer seeking improved gripping in pretty much any type of scenario will gain an advantage when applying the product. Whether one is utilizing the latest and greatest on the driest day of the year, or using twenty year old equipment on a blistering 100 degree day, the Grip Boost golf product will improve the gripping confidence. For more information, visit www.GripBoost.com. When will it become available? I do not see the spray available for purchase on their website. I just called the company and was told that it would be available to purchase from their website in a few minutes. Nice review Dan. I think this is a very solid product especially when the humidity can pose a big problem with grips. I would definitely be interested in using it for my myrtle beach trips. From them, it looks like later this year. Thanks for the review. This is a constant problem for me. I was able to order two bottles directly from them and should have it next week. Hey Dan, Just checked out this product and it seems to be available on Amazon now.